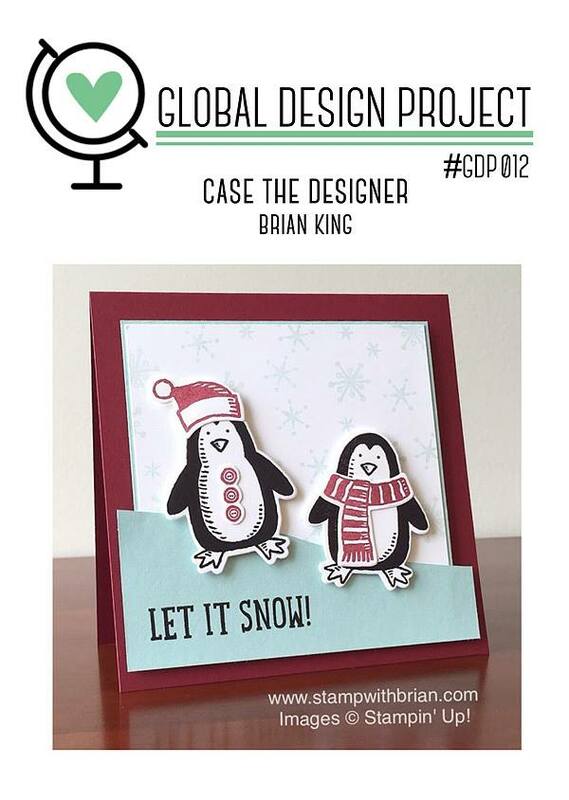 This week we are casing the designer and the wonderful designer is Brian King. I have been able to get to know Brian since being on the design team and he is the most lovely, sweet man you will ever meet! I really did not intend to make another Christmas card but the offering the current seasonal is so vast I don’t think I will ever need another Christmas stamp set to stay inspired! One of my team shared a technique at the recent OnStage event and it got me inspired to try it with the back ground stamp from ‘You’ve Got This’. I tore some rough paper to create the hilly background and stamped the sketchy background twice using Sofy Sky and Smoky Slate Ink. I stamped a piece of smoky slate with the technique using the Watercolour Wash background stamp and ink refills and then stamped the tress in versamark and heat embossed them with white embossing powder. I added a little dazzling diamonds using the 2 way glue pen and then punched the small stars from the Confetti Stars Border Punch. I used the sentiment from the Peaceful pines stamp set and added a little music paper and a glimmer star to finish it off. 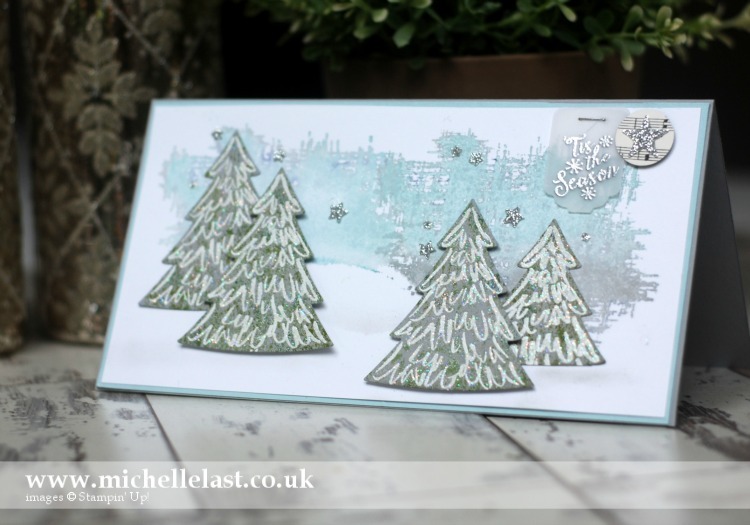 So why not join us and make a card using the sketch above and share on the Global Design Project Challenge blog, we would love to see what you made! Here are the supplies I used to make this card, if you place an order via my online shop please don’t forget to use the hostess code if your order is more than £20+ and less than £150. Click any of the products below to go direct to my online shop. Oh, Michelle – This technique is amazing. What a beautiful backdrop for these lovely trees! I’m so happy I’ve been able to get to know you and am so happy that you played along with this week’s challenge to CASE my card. I’m in love with the serene scene you created – and all from two silly penguins on a snowbank. Your project – as always – is gorgeous. Thank you Brian, I love how everyone interpretations are so different. But we could not go wrong with such wonderful inspiration to start with! I love this card!! It is gorgeous! I may have to case this as it has quickly become one of my favorites for Christmas. I am amazed how you came up with this from the penguin card. you are amazing and creative. A stunning creation, I had to stop for a few minutes to take in all the little details and there are just so many. Each and every week, I am blown away by your creations. 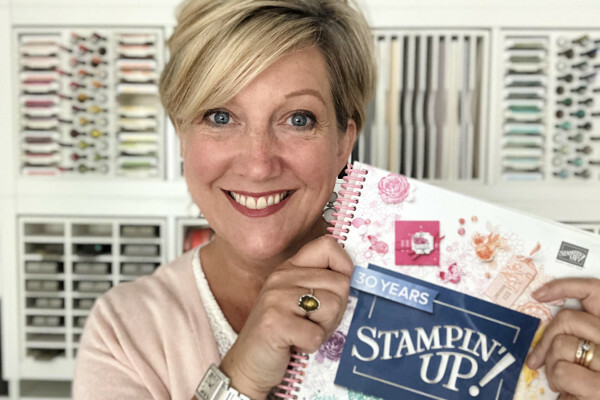 Michel you are the best …love your work and congratulations for all the achievements in your career in Stampin Up! whoo hooo 8 years sharing the best creativity, ideas and being such amazing support for the SU team in the UK. Besos!!! I would have never thoughtto use the You’ve got this like that! so cleaver! 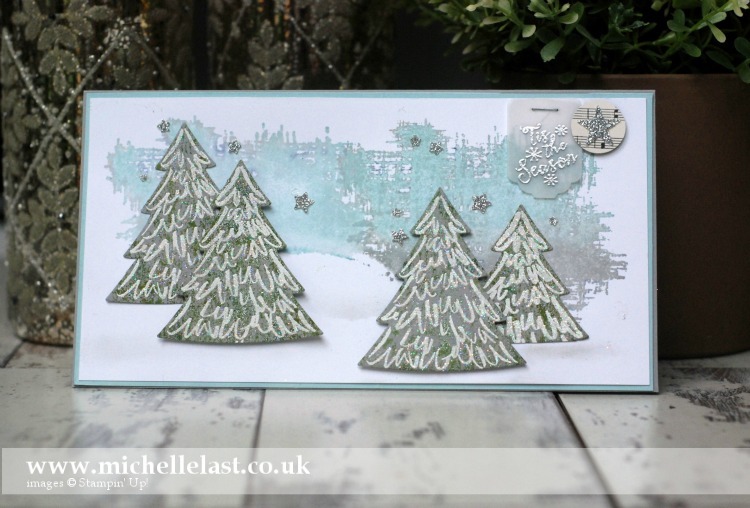 Michelle, I love the frosty background you achieved on this card. It makes me want to cozy up with a blanket. Beautiful work. Classic, elegant and really lovely details. Love it, Michelle.